Summary – The Personal MBA gives a soup to nuts overview of how to manage and improve businesses. However, before you write this book off as another self-promotion for business consulting, read the first few chapters. This section of the book asks some very direct questions and lends guidance to the answer if a given business should be started in the first place. This book is required reading for anyone thinking about starting their own business. After lending solid advice on if and how a business should be started, the author lends fundamental support to how the business should expand. This is done by lending insight into how people think, decide and develop and assign value. It also details how to identify and move into markets and create and care for a solid customer base. Each moment spent reading this book is time well spent. Business Takeaway – This book guides the reader to ask and find answers to tough questions and gives a simple explanation to the fundamental principles of business. Arguments are supported by the experience of the author and his personal thirst for knowledge. The book is also supported by an interesting blog and ever expanding recommended reading list. This book and supporting web site will continue serving the entrepreneur well after the book is read. Personal Takeaway – After reading this book, I realize starting a business may not be as far out of reach as it appears. This entry was posted in Good Books & Papers and tagged Book Review. 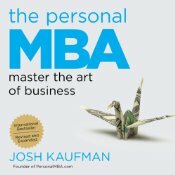 Josh Kaufman, business development, entrepreneur, expanding business, solid advise, starting a business, The Personal MBA: Master the Art of Business, Worldly Wisdom Ventures LLC. Bookmark the permalink.